EXCELLENT ETODEROCERAS - JURASSIC CHARMOUTH DORSET. Lovely complete 3D pyrite Ammonite. To centre both sides and showing blunt umbilical spines. A 'beauty'. Jurassic, Upper Sinemurian, Raricostatum Zone. 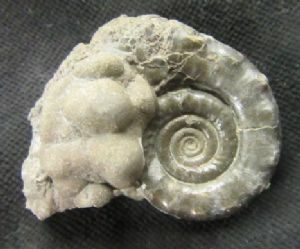 Ammonite : 5.3 cm. diam.